Cargolux Boeing 747-8F in a special "cutaway" livery celebrating the airline's 45th anniversary. The airline was established in March 1970 by Luxair, the Salen Shipping Group, Loftleiðir and various private interests in Luxembourg. Einar Olafsson was the airline's first employee and CEO. It started operations in May 1970 with one Canadair CL-44 freighter with services from Luxembourg to Hong Kong. Over the next two years, the airline grew, as did its public visibility. By 1973, Cargolux had five CL-44s and made the leap into the jet age by acquiring a Douglas DC-8. This enabled the company to speed up its cargo deliveries. In 1974, Loftleiðir and Cargolux amalgamated their maintenance and engineering departments, and by 1975, Cargolux enjoyed new facilities consisting of central offices and two hangars. In 1978, the airline began to take shape into the company it is today. The CL-44s began to be retired and the airline ordered its first Boeing 747s. In that same year it also began flying to other places in Asia, as well as to the United States. In 1979, as the company concluded its first decade, its first Boeing 747s were delivered. In 1982, China Airlines became the first airline company to sign a strategic alliance with Cargolux. 1983 saw the introduction of CHAMP (Cargo Handling And Management Planning) and the start of some charter passenger flights for the Hajj pilgrimage. 1984 saw the departure of the last Douglas DC-8 in the fleet and the addition of a third Boeing 747. Lufthansa bought a 24.5% share of the airline in 1987 and Luxair increased its share to 24.53%. 1988 saw the birth of Lion Air, a passenger charter airline established by both Cargolux and Luxair. The airline had two Boeing 747s but Cargolux's venture into the charter airline world proved unsuccessful and soon Lion Air folded. 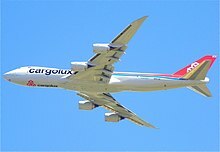 Despite that setback, Cargolux made it into the 1990s in proper financial shape. It added two more Boeing 747s in 1990, as a way of celebrating its 20th anniversary, and in 1993, three Boeing 747-400Fs arrived at Luxembourg. In 1995 Cargolux had a year-long celebration of its 25th anniversary and Heiner Wilkens was named CEO and President. In 1997, Luxair was able to increase its share to 34%, while in September that year Lufthansa sold its 24.5% stake to Sair Logistics; and Swissair Cargo made a cooperation agreement with the Luxembourg company. The following year Sair Logistics increased its share to 33%. By 1999, Cargolux's fleet had reached double figures, with 10 Boeing 747s. In 2000 a route was opened to Seoul, South Korea, and in 2001 Wilkens decided to step down as President and CEO of the air company. In October 2010, Ulrich Ogiermann, the chief executive officer of Cargolux was indicted on suspicion of price-fixing; After pleading guilty, he was sentenced to 13 months in federal prison. In November 2010, Cargolux was fined, for price-fixing, by the European Commission. On 17 September 2011 Cargolux announced that it would not accept the first two Boeing 747-8F aircraft it had ordered, scheduled for delivery within a few days, due to "unresolved contractual issues between Boeing and [the airline]" concerning the aircraft. After resolving their contractual issues, Boeing handed over the first 747-8F to Cargolux in Everett, Washington on 12 October 2011. The freighter then flew to Seattle–Tacoma International Airport and picked up cargo before flying to Luxembourg. Cargo 2000 — an industry group within the International Air Transport Association (IATA) consisting of some 80 major airlines, freight forwarders, ground handling agents, trucking companies and IT providers — announced on 15 March 2012 at its annual general meeting, that Cargolux Airlines International S.A. had gained Cargo 2000 platinum membership status. Boeing 747-8F 14 — Launch customer; one painted in "cutaway" special livery. On 21 January 2010, Cargolux Flight 7933 landed on a vehicle that was on an active runway. There was one injury and no fatalities in the crash. Three investigations were launched into the accident. The cause was found to be error by Air Traffic Control. On 30 March 2017, a Cargolux Boeing 747-8F (registration LX-VCF) operating as Flight 775 arrived at Prestwick Airport near Glasgow in Scotland carrying a Bell 412EP helicopter from Houston, Texas. The helicopter was observed to have leaked fuel into the cargo hold, reportedly amounting to more than 300 litres. The fuel leaked into the avionics bay and caused substantial damage. The aircraft returned to service almost a month later. ^ "Directory: World Airlines". Flight International. 2007-04-03. p. 61. ^ "In the beginning" Archived September 19, 2011, at the Wayback Machine, Cargolux. Retrieved 9 September 2011. ^ "Cargolux chief indicted over alleged price-fix conspiracy". Retrieved 2010-10-31. ^ "Eleven airlines fined in European cargo cartel investigation". Retrieved 2010-11-10. ^ "Cargolux to extend network thanks to partnership", Wort-lu. Retrieved 9 September 2011. ^ "Qatar Airways ditches Cargolux stake". Retrieved 2012-11-17. ^ "It's official: Qatar Airways to split from Cargolux". Retrieved 2012-11-17. ^ "Cargolux unions against bigger control by Qatar Airways". Retrieved 2012-11-17. ^ "Unions fear Qatar move on Cargolux". Retrieved 2012-11-17. ^ ""We invested in a new fleet of 747-8F aircraft, which are a lot more environmentally friendly"". The Business Report. 22 January 2018. Retrieved 22 January 2018. 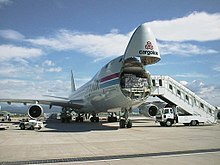 ^ "Cargolux rejects delivery of Boeing 747–8 Freighter aircraft" Archived 2011-09-24 at the Wayback Machine. Cargolux, 17 September 2011. ^ "Cargolux 747-8F dispute linked to late Qatar 787 deliveries". Air Transport Intelligence news via flightglobal.com, 19 September 2011. ^ Ostrower, Jon. "Boeing delivers first 747-8F". Flightglobal.com, 12 October 2011. ^ "Cargolux Achieves Cargo2000 Platinum Membership Status". Amcham Luxembourg. 16 March 2012. ^ "Relevé luxembourgeois des immatriculations" [List of Luxembourgeois registrations] (PDF) (in French). Direction de l’Aviation Civile (Directorate of Civil Aviation). 12 December 2016. Retrieved 12 January 2017. This page was last edited on 13 April 2019, at 16:38 (UTC).